We are sorry to announce that the August teachings following have been cancelled due to the circumstances in Tibet & India at the moment. On 17th August 2008 Venerable Gan Yontan Gyatso will give oral transmissions (Lung)on Gungthang Tenpai Donmes' (1762-1823) eleven volumes and Kunkyen Lama Jamyang Shepas' six volumes out of the fifteen volumes which survive the lineage (1648-1721). These written works are the text books of the Gomang College which is part of one of the largest Monasteries of Tibet and also of Labrang Tashi Kyil as well as monasteries in Mongolia. Drepung Monastery was founded in 1416 near Lhasa, the capital of Tibet. Gomang Dratsang (or College) is the oldest of the 4 colleges of Drepung. In 1959, before the invasion of Communist China, Drepung monastery had more than 10,000 monks. Gomang alone had about 5,500. Since its beginning, Gomang College has produced many eminent Buddhist masters and has been a very important Tibetan and Buddhist learning center. 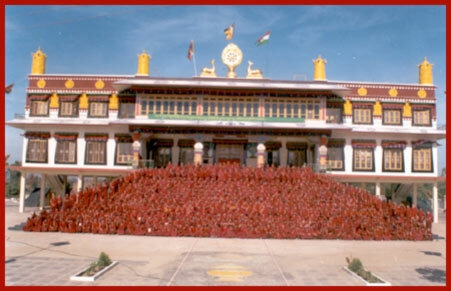 Each of the colleges of Drepung has its speciality and the focus of Gomang is philosophy: logic and debate.